1.Soak the soy pieces in water for at least 40 to 60 minutes. Squeeze out water. Divide the pieces of soy into 2. 2. For the red colored satay: in a small bowl, mix 1 tbsp soy sauce paste, 1 tbsp red rice yeast paste, ½ tbsp brown sugar, pepper and the soy pieces for 5 minutes. Meanwhile, slice green pepper very thin. Take one piece of soy and roll a piece of green pepper, place it on the skewer. Continue doing this until all soy pieces are done. Bake the soy with green pepper on the skewers for 15 minutes in a 375F oven. 3.For barbecue satay: in a small bowl, mix 1 tbsp soy sauce paste, 2 tbsp vegetarian barbecue sauce, some black pepper, ½ tbsp brown sugar, and soy pieces for 15 minutes. Then add corn starch to the mixture and let stand for another 5 minutes. In a sauce pan, with enough hot oil to deep fry the soy pieces. 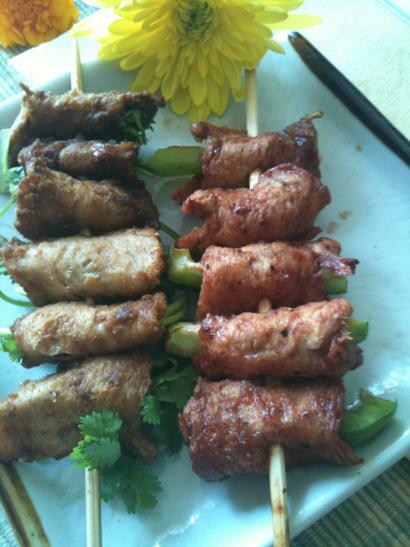 Roll the cooked soy pieces with cilantro leaves and place them on the skewers. 4.If you cannot find red rice yeast paste in the Asian market, then ignore it. Red rice yeast has been well known for lowering bad cholesterol. 5.Only Chinese vegetarian barbecue sauce has that Indonesian satay flavor. 6.Soy sauce paste can be found easily nowadays in America. If you cannot find it, use soy sauce but ½ the amount and a little bit more sugar.